After eating Filipino food at Bonifacio, cakes at Broadway Cafe and drinks at DYMK–that’s 5 hours of continuous eating and drinking–Hookerlily, Mr NGFL and Wise Guy continued eating Korean food! We have been to 2D1N Soju Bang Buffet on the second storey of the shophouse several times. The excellent Buffet was very scary, not for the faint-hearted. It is like a war zone with smoke all over (grenade smoke) and people rushing for food like war-hungry citizens. Service: As we have said in the entry in Todamgol, the Korean restaurant across the street, the female servers in Todamgol are hot but at 2D1N, the boys are hot. Hookerlily said to Wise Guy, “Now why can’t you dress like the waiter?” The waiter wore a black long-sleeved tee with berms and deck shoes. Hookerlily, “Then how come you two look different? ?” WTH!!! True friends insult each other. Perhaps goodlooking people are meant to be wallflowers; he shouldn’t wait on tables. 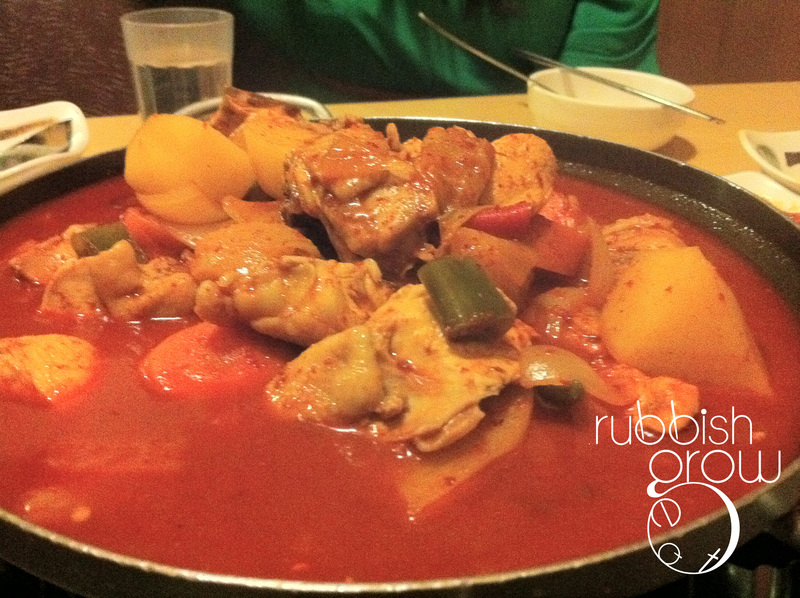 We ordered dakdoritang ($35), a spicy bean-paste chicken hotpot. A bowl of rice costs $2. The dish was value-for-money! Huge portions and the soup was very tasty, especially when drizzled over rice. AWESOME. But it got one-dimensional after a while. We spent $45.90 for three in total – very worth the money. The food was good, the privacy was bonus, and the service was tolerable. Recommended. Will be back.